This Boy Risks His Life To Hold A Baby Deer Above The Raging Floodwaters And Save Its Life. A fearless boy risked his own life and showed incredible bravery to rescue a helpless baby deer from drowning in a raging river. 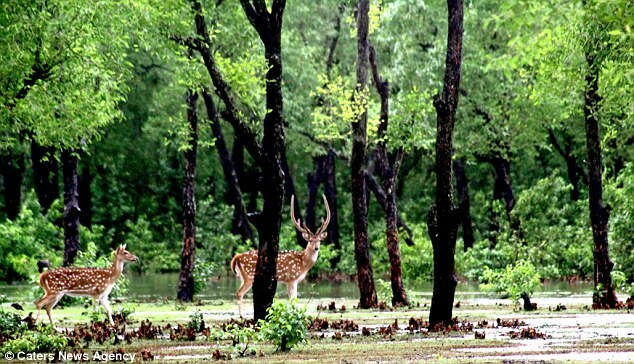 The boy, whose name is Belal and is believed to be in his early teens, held the fawn with one of his hands above his head as he fought his way through a surging river in Noakhali, Bangladesh. During the rescue, onlookers were unsure whether or not the boy would make it to the safety of the river bank. But he did make it to the other side and was cheered as the deer was reunited with its family. 10. The baby deer was reunited with its family after it was saved from the river in Bangladesh. Risking his own life, a brave boy rescues a fawn from drowning. Share this heartwarming story of bravery and humanity with your friends below — they would want to see that, too. Opening Her Front Door, A Woman Meets An Unexpected Guest. A Fascinating Video Captures The Encounter.